Go Ahead, Be Ticked Off! Northeast is still the 'hotbed' of tick-related Lyme disease. Yes, birds are singing, plants are flowering and tractors are reving. But spring is also when dangerous creeping crawlies – ticks in particular – crawl out in force. Blacklegged or "deer" ticks are more common throughout the Northeast than they used to be, warns Penn State Extension Entomologist Steve Jacobs. New York is the number one state in the nation with confirmed cases of Lyme disease. Massachusetts, Pennsylvania, New Jersey Connecticut and Maryland fill out the top six states. BUGGING YOU? The "babies" of this larger-than-life deer tick are most likely to be undetected long enough to infect you with Lyme disease. "A decade or so ago, these ticks were rare in many Pennsylvania counties, notes Jacobs. "But today, unfortunately, a majority of Pennsylvania counties have populations of blacklegged ticks. And, they often carry and spread Lyme disease." Lyme disease usually starts with a bull's-eye-like rash. Other symptoms may include fever, stiff neck, muscle aches and headaches. is treated with antibiotics. But it's often not caught early. And in such cases, recovery can be slow and difficult. Immature ticks are active in May, June and July. Nymphs will attach to mice, chipmunks, birds and other small animals. Adults typically attach to white-tailed deer or other large mammals. Awaiting their prey (a suitable host), they also are found on leaf litter or low branches in brushy, wooded areas. "The larval and nymphal stages of the tick are no bigger than a pinhead," warns Jacobs. "Adult ticks are only slightly larger. Nymphs most often transmit Lyme disease to humans, probably because they're so small they go unnoticed on a person's body." Unnoticed, they often have time to feed and transmit the infection. Ticks need to feed for 24 to 36 hours to transmit Lyme disease, he says. • Wear light-colored clothing so that ticks can be spotted more easily. • Tuck pant legs into socks or boots and shirt into pants. • Spray insect repellent containing DEET on clothes and on exposed skin other than the face, or treat clothes (especially pants, socks and shoes) with permethrin, which kills ticks on contact. • Wear a hat and a long-sleeved shirt for added protection. 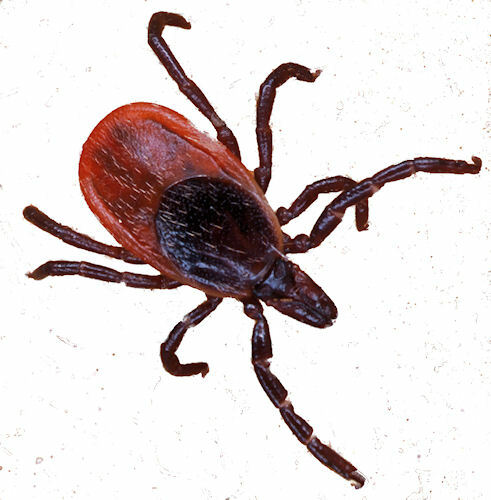 Know the signs of Lyme disease, and see your doctor if symptoms develop, urges Jacobs. "If a tick is found attached to a person, carefully remove it by grasping it with tweezers as close to the skin as possible and pulling straight back with a slow, steady force. Avoid crushing the tick's body." Learn more about blacklegged ticks and Lyme disease at http://www.ento.psu.edu/Lyme/default.